You are here: Home / All blog posts / Design progress! This is a calf-length jacket, which (like the wedding-coat) is fastened by hooks and eyes in the front, opening up below the waist.Â Autumn leaves on gold gauze run down the two center panels in front, and down the single panel in center back.Â We’re still discussing whether to use gauze (and possibly leaves) on the front and back side panels. 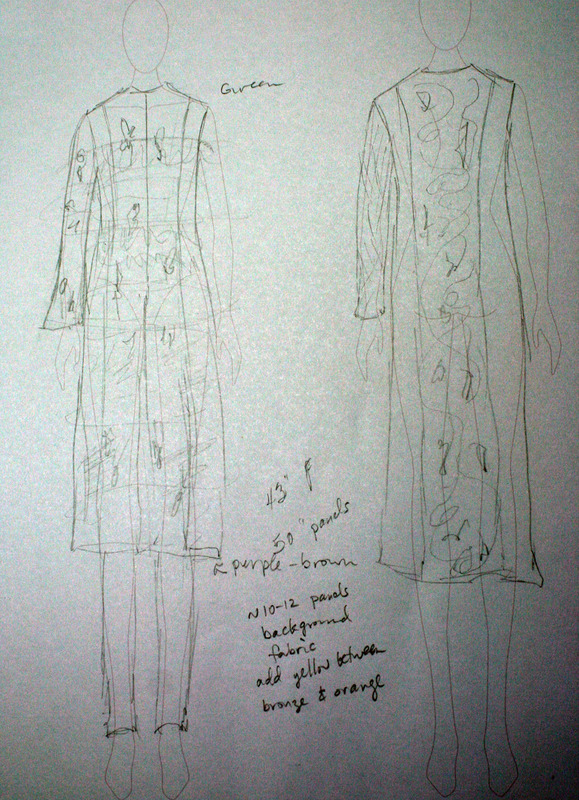 You’ll notice that we’ve added sleeves.Â We haven’t really settled on this yet; the left-hand (front) shows a bell sleeve and the right-hand sketch (back) shows a slightly tapered sleeve.Â I like the idea of the gold gauze floating on the sleeve, but wasn’t sure about adding more autumn leaves.Â We both agreed that we’d have to see it to know for sure.Â You can only get so far on samples. We also agreed that the falling leaves should shade from yellow-bronze to gold, orange, red, purple, brown – with some gold embroidery and/or beads to make them stand out.Â (Especially the brown leaves, which might otherwise get lost against a purple-brown background. )Â We’ll establish the colors and color sequence more firmly once the background fabric is woven. I do not, however, plan to wind and weave all the warp in one go.Â Wisdom suggests that a single panel as a sample might be a good idea before committing to 28 yards of warp.Â Also, I will need to clear the loom sometime between now and August in order to weave samples for the article I’ve agreed to write for Handwoven, which means that a 2.5 month project is probably not a good idea.Â Finally, weaving off a 25+yard warp that long in fine threads in a two-shuttle weave sounds like an Endless Project.Â A girl needs a little variety! So I’m going to start by warping up for two or three panels, weave one up as a sample, and see how that goes before committing to more.Â I suspect there will be considerable fiddling before I get the sample right, which is why I’m putting on enough warp for several panels. I will also, honest to goodness, start working on that Handwoven article again.Â It’s not due until August 1, but dates have a way of creeping up on you, and being a project manager, I feel obliged to uphold the honor of my profession with an on-time delivery.